Home › Uncategorized › Inspiration is Everywhere! As I fly to Trinidad yet again, I realize how much has happened since the last time I flew back from there in Sept 2014. 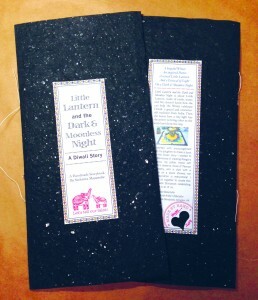 Then, I was struggling to finish a story I was working on—Little Lantern and the Dark & Moonless Night. Today, I think of the hundred copies I have to make of that same Handmade Storybook for two school author visits at the end of March 2015! 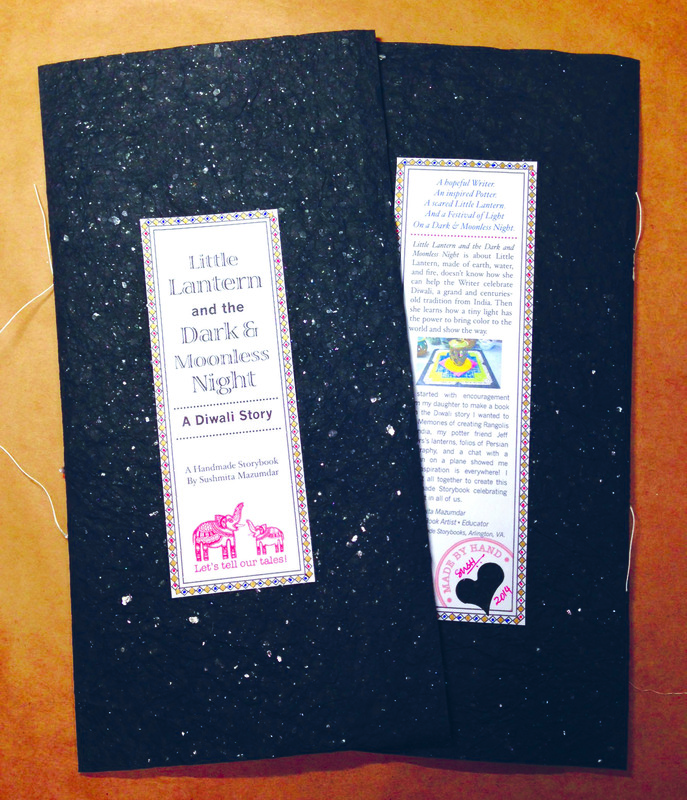 In an amazing collaboration with the Washington DC-based family engagement organization Turning the Page (TTP), 100 families will get a copy of my book Little Lantern and the Dark & Moonless Night. Not only that, when Ellie Canter of TTP was approached by Imagination Stage, a children’s theater and arts education program based in Bethesda, to apply for a grant from the D.C. Commission for the Arts and Humanities (DCCAH), she immediately thought of my book and upcoming visits to TTP’s partner schools. March is Arts Education Month and the DCCAH is celebrating the occasion with over 200 arts-based workshops occurring across the District. As a result of the grant, Imagination Stage teaching artists have now created a theatre-based lesson plan that will introduce my book for the second graders at Savoy Elementary School through an exploration of how stories are told through mudras and other movements. 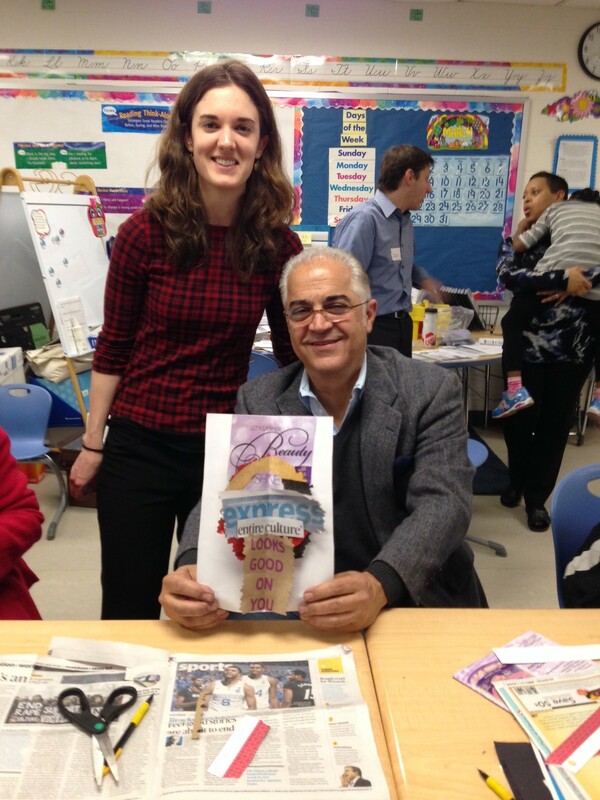 Savoy strives to include the arts in their classroom instruction and partnerships and if you want to think of how the arts are part of this project, let me show you. It started with my daughter. She said if I didn’t like the books out there that tell the stories of Diwali, I should make my own. I was, after all, a book artist. As I looked online for inspiration, I saw a photo of beautiful ceramics my friend Jeff Rogers was creating in his new studio in Florida, Gumbo Limbo Pottery. His Lanterns caught my eye. I wanted them for Diwali. Could my Diwali storybook be about the Lantern? I looked at rangoli designs we made out of colored powders in the middle of which we put our diyas or lamps. If I create a rangoli I can put the Lantern in the middle instead. But what do I create the rangoli out of? How about layering colorful Asian handmade papers? I made a sketch and tried it out. I stacked papers of different sizes—biggest at the bottom—and made a paper rangoli. I folded it up in half—these would be the pages of my book! But how do I hide the text under them so you don’t see the words when the rangoli is in full view? As I studied to give tours of the exhibit Nastali’q: The Genius of Persian Calligraphy in the Sackler Gallery of Art, I saw how the Persian book-makers put the text really close to the binding so as to show off the broad and beautifully decorated borders. I put my text boxes really close to the binding as well. Now you don’t see any text when the book or rangoli is open! 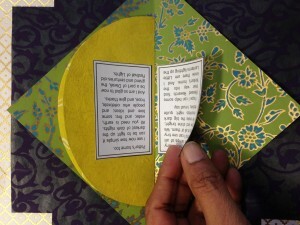 First, I design and cut templates (right) of my rangoli layers, which are the pages of the book. 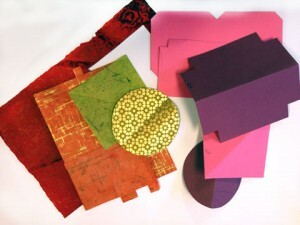 Then, from my collection of Asian handmade paper I pick out papers that will work well together. The shapes are symmetrical so I fold the decorative papers (left) and place the folded template on it and cut. Next, I arrange the layers keeping in mind not to repeat colors. I think almost every book will have a different combination of colors for the pages! Then I fold them shut and press them down under heavy books for a few days. This flattens them so the book stays closed when complete. Next, I add the covers. The paper I am using is called Crystallized Mica- Black and I picked it because it looks like a moonless, yet starry night! As I was sewing the covers onto the books the sun streamed into my studio and I got a picture of sunlight on my moonless nights! 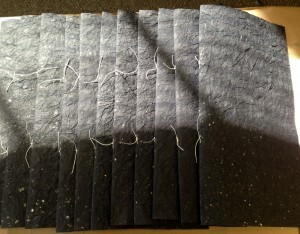 After the covers are sewn I print out the text, cut out each panel, and put them on the pages of the book. 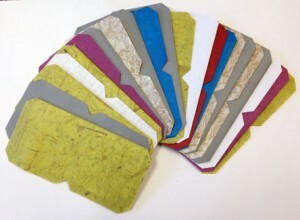 Of course, each page is a different shape, color, and print or texture. Final books: With cover text and back cover text added on. Inspiration exists in a semi-circle– as the children of Savoy Elementary tug eagerly on a piece of yarn that marks their place at the author’s feet. Inspiration spills from the edges of a sand rangoli as its patterns peter out onto paper – its colors lifted by lantern light. 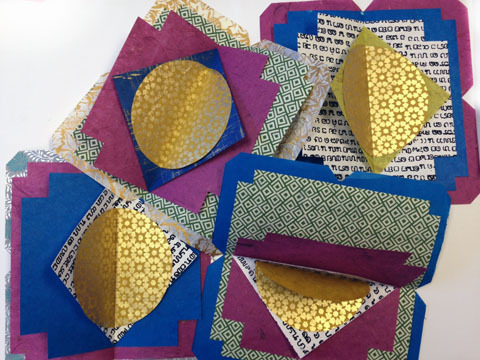 Inspiration asks adults to create, with papers parceled out from the textures we touch daily – the news print, the magazines, and the grocery bags that grow tired of their formal duties. Inspiration resides in remembering how to play – especially when we have almost forgotten what that freedom feels like, as paper piles and stacks of scissors invite stories from their handlers. And inspiration exists in sharing your work with strangers-turned-friends whose stories – like so many layers of paper, set one on top of the other, become a layering of lives, all multi-faceted and filled with strength.